Find Kimpton EPIC Hotel deals, discounts and special offers. Hotel offers guests luxurious accommodations, full-service spa and state-of-the-art fitness center. Stay in Miami + Great Low Rates! This downtown Intercontinental has 641 redecorated rooms, with views of Biscayne Bay, minutes from South Beach. The Four Seasons is an urban hotel, with 50,000 sq ft spa, 221 guest rooms and suites in a 70-floor building. This hotel with French ambiance is 5 minutes from the airport, features a garden terrace and overlooks a blue lagoon. The contemporary-design Conrad has 203 guest rooms, 103 suites, and is in the heart of the business district. Located on Brickell Key, this Asian influence hotel offers bay views, private beach, and a spa. 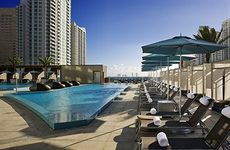 The Hyatt is in downtown Miami, next to the convention center, with 612 rooms, t-mobile wireless, and flat screen TVs. This resort offers 5 championship courses, waterfalls and waterslide, restaurants, and meeting spaces. Turnberry Isle is on 300 acres, with 92 rooms, 2 golf courses, a spa, tennis, and lagoon pool and ocean club. Located 10 minutes from the airport, the Hilton is on a peninsula, with 500 rooms, pool, sports, and a jogging path. Located on the Bay in Coconut Grove, the 12-story Mutiny Hotel and 1 and 2 bedroom suites, and outdoor pool. A boutique hotel with 129 rooms and suites, this hotel and spa is located in Coconut Grove, with a Jurlique Spa. Located near Miami Int'l airport, this 265 room hotel has a 24 hr. fitness center, casual dining, and lounge. Hotel is within minutes of Miami's bustling shopping scene, dining and nightlife. Luxury accommodations await guests of this hotel that features a rooftop swimming pool, fitness center and lounge.